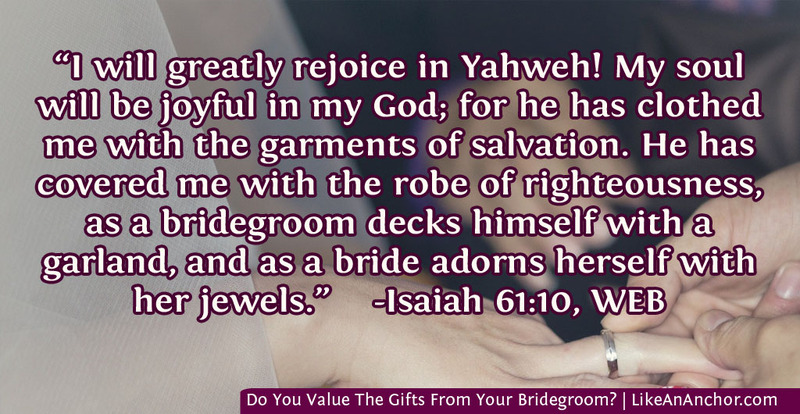 Do You Value The Gifts From Your Bridegroom? God has invited us to become part of the greatest love story ever told. As Jesus said, “The kingdom of heaven may be compared to a man — a king — who gave a wedding feast for his son” (Matt. 22:2), LEB). That’s what God the Father is doing. He’s inviting us to be part of the marriage He’s planing for His son in the key role of the bride. The people listening as Jesus spoke this parable would have known about all the wedding customs implied by this comparison. If you want to learn more about what was involved in a father planning his son’s marriage, I recommend “The Ancient Jewish Wedding” by Jamie Lash (click to read). There’s a lot of incredible things in these traditions that point to Jesus, but we’ll just focus on one for today. 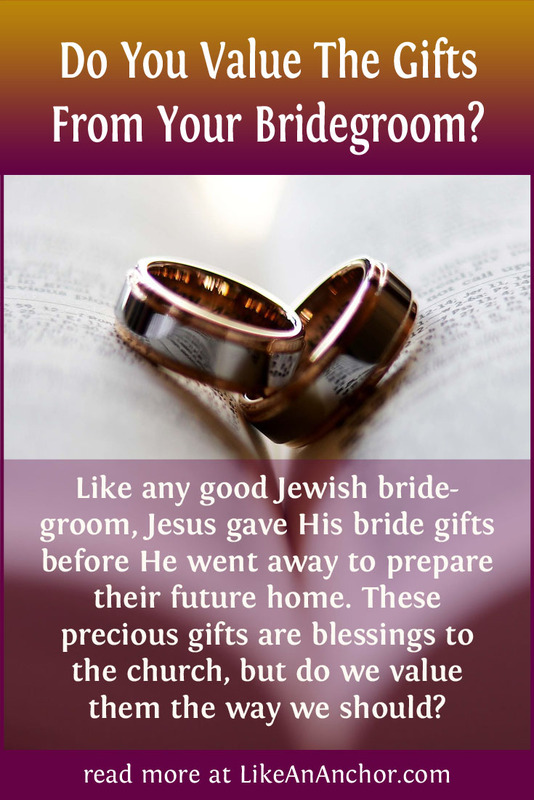 A Jewish bridegroom would give his bride gifts as part of the betrothal process. He’d seal the betrothal agreement and then go away for a while to prepare their new home, leaving a gift along with his pledge to return. The gift(s) were meant to remind the bride of her groom. Think of it like an engagement ring. It’s no surprise, then, that our bridegroom Jesus Christ also “gave gifts to people” (Eph. 4:7-8, WEB). As we talked about in my Pentecost post earlier this year, the holy spirit is the chief of our bridal gifts. The holy spirit wasn’t given until after Jesus was glorified and had fulfilled the other parts of establishing the marriage covenant (John 7:39). Only then did He and His father give “the gift of the holy spirit” (Acts 2:38). Each time God gives the holy spirit to a new believer, He’s marking us as belonging to the Bridegroom and pledging that He will come back and fulfill all His promises. The gifts don’t stop there, though. We’re also given additional gifts through the spirit, and Jesus gave gifts including life, grace, righteousness, and salvation. In fact, every good gift comes from God. Every single one of the good and perfect gifts we’ve received are given by God. This includes the gifts of the spirit given to each believer (Rom 12:6-8; 1 Cor. 12:4-11), the gift of “eternal life in Christ Jesus our Lord” (Rom. 6:23), and also the gifts given to ancient Israel even before Messiah came (Rom. 11:26-29). It might seem like a strange idea (depending on your church background) to see the things given to ancient Israel as gifts for the believer today. But they were certainly gifts, and they were given by the same God we worship now. These gifts haven’t been revoked (Rom. 11:29). In fact, Jesus said He’s filling the law and prophets to their fullest extent, that breaking them is wrong, and if you’re not righteous you won’t be in His kingdom (Matt. 5:17-20). We’re not saved by things like keeping the Sabbath and holy days, but we should value them as gifts from our Bridegroom. He is honored and He feels loved when we keep His commandments and His holy days faithfully. As I write this post, we’re in the midst of the fall holy days. Yom Kippur (Day of Atonement) was this past Wednesday and Sukkot (Feast of Tabernacles) begins on Monday. These days all point to Christ’s second coming and His millennial reign on earth, with us there as His bride. They are “shadows” indicating the substance found in Christ (Col. 2:16-17, see also my post “Commandments of Men“). Treasuring and observing these days as gifts from our Bridegroom serve as yearly reminders that He is going to come back. He will not leave us alone, and He gives us a taste of what life will be like when we’re with Him forever by calling us to assemble together with Him on His feasts (Leviticus 23). I love keeping these days with Him. The Lord can hear us any time we call on Him, of course, but there’s something extra special about being with Him on the days He set apart as holy times for us to spend together. May the Lord bless and keep all of you through this precious, holy season. Shalom and chag sameach!